Carglumic acid is a Carbamoyl Phosphate Synthetase 1 Activator. The mechanism of action of carglumic acid is as a Carbamoyl Phosphate Synthetase 1 Activator. For the treatment of acute and chronic hyperammonaemia in patients with N-acetylglutamate synthase (NAGS) deficiency. This enzyme is an important component of the urea cycle to prevent build up of neurotoxic ammonium in the blood. Carglumic acid exists as a white powder or colourless crystals. It is soluble in boiling water, slightly soluble in cold water and practically insoluble in organic solvents (cyclohexane, dichloromethane, ether). The water solubility of carglumic acid at pH 2.0 is 21.0 g/L. It increases rapidly between the pH 3.0 (28.2 g/L) and the pH 5.0 (440.9 g/L). The solubility of carglumic acid in water is stable between pH 6.0 (555.5 g/L) and pH 8.0 (553.9 g/L). Carglumic acid is prepared from L-glutamic acid. It exhibits stereoisomerism due to the presence of one chiral centre and has one optical isomer; N-carbamoyl-D-glutamic acid. Literature References: Metabolically stable analog of N-acetylglutamate, a physiological activator of the first enzyme of the urea cycle, carbamylphosphate synthetase (CAPS). Prepn: H. McIlwain, Biochem. J. 33, 1942 (1939). Effect on blood urea and ammonia levels and potential clinical application: J.-E. O’Connor et al., Eur. J. Pediatr. 143, 196 (1985). Evaluation in treatment of CAPS deficiency: G. Kuchler et al., J. Inher. Metab. Dis. 19, 220 (1996); of N-acetylglutamate synthetase (NAGS) deficiency: B. Plecko et al., Eur. J. Pediatr. 157, 996 (1998). Therap-Cat: In treatment of inherited urea cycle disorders. CARBAGLU tablets for oral suspension, contain 200 mg of carglumic acid. Carglumic acid, the active substance, is a Carbamoyl Phosphate Synthetase 1 (CPS 1) activator and is soluble in boiling water, slightly soluble in cold water, and practically insoluble in organic solvents. Chemically carglumic acid is N-carbamoyl-L-glutamic acid or (2S)-2-(carbamoylamino) pentanedioic acid, with a molecular weight of 190.16. The inactive ingredients of CARBAGLU are croscarmellose sodium, hypromellose, microcrystalline cellulose, silica colloidal anhydrous, sodium lauryl sulfate, sodium stearyl fumarate. Carglumic acid is an orphan drug used for the treatment of hyperammonaemia in patients with N-acetylglutamate synthase deficiency. This rare genetic disorder results in elevated blood levels of ammonia, which can eventually cross the blood–brain barrier and cause neurologic problems, cerebral edema, coma, and death. Carglumic acid was approved by the U.S. Food and Drug Administration (FDA) on 18 March 2010. 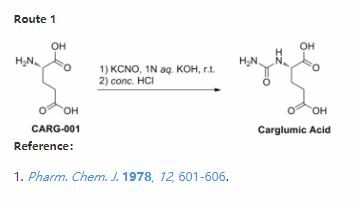 Carglumic Acid is an orally active, synthetic structural analogue of N-acetylglutamate (NAG) and carbamoyl phosphate synthetase 1 (CPS 1) activator, with ammonia lowering activity. NAG, which is formed by the hepatic enzyme N-acetylglutamate synthase (NAGS), is an essential allosteric activator of the enzyme carbamoyl phosphate synthetase 1 (CPS 1). CPS 1 plays an essential role in the urea cycle and converts ammonia into urea. Upon oral administration, carglumic acid can replace NAG in NAGS deficient patients and activates CPS 1, which prevents hyperammonaemia. Carglumic acid is an orphan drug and a derivative of N-acetylglutamate that activates the first enzyme in the urea cycle that is responsible for removal and detoxification of ammonia, making this drug a valuable agent for therapy of hyperammonemia caused by rare forms of urea cycle defects. Clinical experience with carglumic acid is limited, but it has not been linked to significant serum enzyme elevations during therapy or to instances of clinically apparent acute liver injury. Carglumic acid is an orphan drug, marketed by Orphan Europe under the trade name Carbaglu. Carglumic acid is used for the treatment of hyperammonaemia in patients with N-acetylglutamate synthase deficiency. The initial daily dose ranges from 100 to 250 mg/kg, adjusted thereafter to maintain normal plasma levels of ammonia. The US FDA approved it for treatment of hyperammonaemia on March 18, 2010. Orphan Drug exclusivity expired on March 18, 2017. Carbaglu (carglumic acid) Tablets 200 mg, is a white elongated tablet with three score marks on both sides engraved C’s on one side. It is a dispersible tablet designed to be dispersed in of water and ingested or administered through a syringe via a nasogastric tube. It is indicated for treatment of acute hyperammonemia in patients with NAGS deficiency. The drug substance, carglumic acid, is an allosteric activator of a critical urea cycle enzyme, carbamoyl phosphate synthetase (CPS). It is a close analog of the naturally occurring activator, N-acetyl glutamate (NAG). Carglumic acid is a urea-like derivative of the amino acid L-glutamate and contains one chiral center. The drug substance solid form is the neutral dicarboxylic acid and is a white crystalline powder. The water solubility of the drug substance depends on the . polymorphic solid form has been found. The drug substance is manufactured by . detected in several batches and therefore routine testing is not required. Regarding drug substance specification, identity testing is by IR and HPLC. drying, residue on ignition, heavy metals, assay and impurities by HPLC. general, measured total impurities were low in the drug substance, about . Appropriate in-house reference standards were established. substance stored in its original packaging at room temperature is granted. nasogastric tube. The suspension has a slightly acidic taste. Carglumic acid (also called N-carbamyl-L-glutamate, or carbamylglutamate) is an orally active deacylaseresistant synthetic structural N-acetylglutamate (NAG) analogue. NAG, which is formed by the hepatic enzyme N-acetylglutamate synthase (NAGS), is an essential allosteric activator of the enzyme carbamoyl phosphate synthetase 1 (CPS-1). CPS-1 plays an essential role in the urea cycle and converts ammonia into urea which prevents hyperammonaemia. Despite a lower affinity of carbamoyl phosphate synthetase for carglumic acid than for N-acetylglutamate, carglumic acid has been shown in vivo to stimulate carbamoyl phosphate synthetase and to be much more effective than N-acetylglutamate in protecting against ammonia intoxication in rats. The most common adverse effects include vomiting, abdominal pain, fever, and tonsillitis. Jump up^ Caldovic L, Morizono H, Daikhin Y, Nissim I, McCarter RJ, Yudkoff M, Tuchman M (2004). “Restoration of ureagenesis in N-acetylglutamate synthase deficiency by N-carbamylglutamate”. J Pediatr. 145 (4): 552–4. doi:10.1016/j.jpeds.2004.06.047. PMID 15480384. Jump up^ Elpeleg O, Shaag A, Ben-Shalom E, Schmid T, Bachmann C (2002). “N-acetylglutamate synthase deficiency and the treatment of hyperammonemic encephalopathy”. Ann Neurol. 52 (6): 845–9. doi:10.1002/ana.10406. PMID 12447942. Jump up^ “Patent and Exclusivity Search Results”. Jump up^ Drugs.com: Professional Drug Facts for Carglumic Acid. By DR ANTHONY MELVIN CRASTO Ph.D in EU 2003, FDA 2010 on June 7, 2018 .